If you love to play competitively, or leisurely, the Northwest Arkansas area is a golfer’s paradise. The region’s scenic beauty makes it a natural complement to the game of golf. 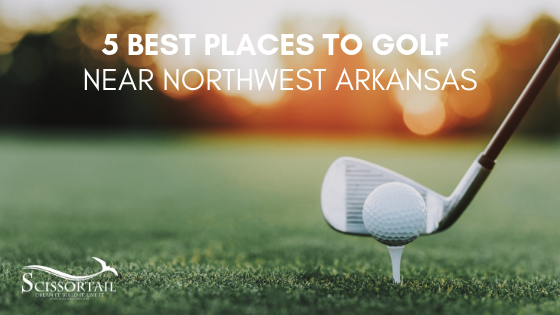 Here’s a list of the best places to golf near Northwest Arkansas that you can’t miss. Blessings Golf Club is a private club and home of the University of Arkansas Men’s and Women’s Golf team. It’s an impeccably maintained course designed to test champion golfers on every shot. The club features an extensive course that stretches over 7,900 yards from the back tees, practice areas, and provides both indoor and outdoor facilities. Pinnacle Country Club is a private golf and tennis club located in the Pinnacle area of Rogers, Arkansas. Their Zorro Zoysia fairways, Tyee Bent Grass greens, and Bermuda thick roughs make it a great place to golf for the casual or competitive golfer. It also features a fantastic tennis program, a private pool with certified lifeguards, and an elegant and spacious clubhouse. Plus, it’s only a short drive from Lowell and Springdale areas. Stonebridge Meadows Golf Club is a stunning public course that has some of the best views in the Ozark Mountains. It has a reputation as the golf course you’ll want to play time and time again. The club has superb course conditions, excellent guest services, and that southern hospitality you won’t forget. Top of the Rock is located right outside of Branson, MO and is known for the first-ever Par 3 course included in a professional championship. Open to the public, this course is perched high above Table rock featuring nature and golf at its finest. Big Sugar Golf Club is open to members and the public. Relax and enjoy one of the most scenic and challenging golf courses in Northwest Arkansas. At Big Sugar, you can practice your swing at the driving range, take some golf lessons, shop at the pro shop, or hang out at the clubhouse. If you’re considering relocating, why not buy a new home in one of the best places to golf near Northwest Arkansas. Enjoy all the best golfing, both private and public when you live at Scissortail. We have beautiful homes in a private, gated community with resorts style pools and stunning clubhouse. We invite you to see all our gated community has to offer. Isn’t it time you lived the life you deserve? Don’t forget to sign up for our newsletter for all the latest on life in Northwest Arkansas and custom home building.